This week’s book is The Life and Times of Luang Phaw Wat Paknam from the Dhammakaya Foundation in Patumthani and is the second impression (ISBN 974-89409-4-2). 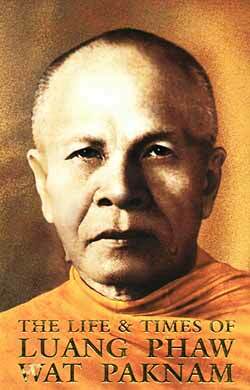 It is a biography of one monk, Luang Phaw Wat Paknam (1885-1959) who it is claimed, rediscovered the Dhammakaya tradition of meditation that had been lost for over 2,000 years. The revered monk, born Sodh Mikaewnoi, whose family was simple rice merchants, was noteworthy right from infancy, as being different from other children, and was known as a deep thinker while at school. By the time he was 18 years old he knew that his future was to be that of an ordained monk, and he entered Wat Songpinong as a postulant. He had been a monk for only a few months and was learning the Pali scriptures when he asked another older monk the meaning of one of the passages, to be told, “Brother, we don’t translate the scriptures here, we just recite them.” For a man with an obvious inquiring mind, this was not a suitable response. With his single-mindedness of purpose he moved to a Wat in Bangkok, where he could study further, but soon found that he had attained the same level of knowledge as his teachers, who then asked him to teach beside them, but he refused, and continued wandering throughout Thailand in search of knowledge. After this he began to study meditation, and in one chapter describes vividly the point at which he managed to let go of pain and allow his mind free rein in meditation. In later chapters his fight for honesty took him into the sights of assassins, surviving a gunshot within the temple building. He also insisted that his wat had no lucky numbers, no holy water, no spells and no fortune telling. The book gives an insight into the course of his life and death and how his teachings are still taught through Wat Phra Dammakaya. It is a small volume, but the English used is delightful, and yet, probably in a Buddhist tradition of selflessness, the author of the English translation is not given, but many people are acknowledged for their input, including the revered monk himself. At B. 150 it is a very cheap insight into the life of a very significant Buddhist monk, but the glossary alone is worth the purchase price, explaining, for example, the difference between an Arahant and a Bodhisattva. We live in a predominantly Buddhist country, and I believe it is incumbent on us all to at least have a passing knowledge of the country’s major religion. For those of you who like a bit of rock ‘n’ roll guitar played at 100 mph with loads of whammy bar, stretched licks, and five hundred notes played a second, when a mere mortal would struggle to get fifty into the same time frame, the sort of guitar playing that is only possible by some of the world’s greatest gurners, then this is the album for you. Back in the year 2000, Joe Satriani, Steve Vai, and Eric Johnson went out on the road in the United States of America doing what can only be described as guitar workshops in rock ‘n’ roll. Each artist had his own band with him and would do an hour’s set, followed every night by the G3 Jam, where all three guitarists would get up on the same stage, giving full reign to a three way guitar battle. Magnificent stuff. Then in 2003 they did it again. This time we still get Satriani and Vai, but the very talented but uncharismatic Eric Johnson had been replaced by the equally talented, but way over the top exuberance of Sweden’s favourite rock ‘n’ roll son, Yngwie Malsteen. The results are explosive to say the least. The first CD of this double CD package is broken up into three parts, where we get a twenty minute section from each artist. First up is Joe Satriani. Quite right that is, too. After all he is the senior guitarist. Satriani sets a remarkably high standard of twiddle for the others to follow. Sticking to basically greatest hits formula, he attacks the frets with the enthusiasm of a teenager. The man is the master of his chosen instrument, even giving us a taste of his acoustic playing on ‘Midnight’, which gives great balance to his segment of the CD. Completely undaunted by this first set, Steve Vai takes to the stage with a lineup that most people only dream of. Apart from his playing powers, Vai’s confidence levels must be at an all time high to bring this lot on tour with him. (However, I suppose being a Frank Zappa prot้g้ must help.) Sharing the stage with Vai are Jeremy Colson on drums; Dave Weiner on rhythm guitar (now do not forget that this guy plays lead guitar in his own band); and then on bass guitar is none other than the five time winner of Guitar Magazine’s ‘Bass Guitarist of the Year’, Billy Sheehan, ex of ‘Mr. Big’, etc. Sheehan played with Steve Vai for a couple of albums and toured with David Lee Roth when he put together a super group after his departure from Van Halen. Then on second lead guitar and keyboards Steve Vai has gone for the talents of Tony MacAlpine. Tony MacAlpine would be worthy of a place in the G3 lineup on his own ability. Just take a listen to any of his solo albums for proof, ‘Edge of Insanity’ (1986) being probably the pick of the bunch. Hearing these three superstars jousting musically at the front of the stage is a real treat to the ears. Let’s hope that some record company suit has the intelligence to release the full segment of the show from this lineup on a separate CD. Whereas both Satriani and Malmsteen split their sections into five parts, Vai sticks to three, giving his band plenty of space to breathe life into their music. There is only one way for Yngwie Malmsteen to go after that, and that is pull all the stops and let it all hang out, which he does with spectacular effect, dispensing with a large band. He comes on with a stripped down trio, Patrick Johannson on drums and Jocke Svalberg on keyboards. However, their role is purely to support this guitar genius. He opens with the aptly named ‘Blitzkrieg’ before leading us through his complete repertoire, partly classically influenced, but with a lot of Blackmore and Hendrix mixed in. His version of ‘Red House’ gives the governor a run for his money. If Malmsteen’s set leaves you breathless, as it should, wait till you open CD two. On disc two you get thirty minutes of all three guitarists on stage, all trying to outshine each other. It’s anybody’s guess which star sparkles the brightest. But if you have your air guitar handy, grab it. You’ll need it to join this lot on stage in your mind. Again Hendrix is given a huge nod of respect as they start out with two of his classic songs before they all rip into the final number, Neil Young’s ‘Rockin in the Free World’. This leads to a final battle to see who can get the last notes in. They may be trying to outplay each other, but you can still feel the friendship and respect for each other shining through the grooves of your disc. 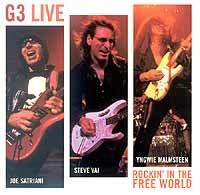 The original idea for G3 was supposed to have included Dweezil Zappa with Steve Vai and Joe Satriani, but prior commitments made this impossible for Zappa, so Eric Johnson stepped in. May I suggest that Dweezil Zappa makes time (listen to his album ‘Automatic’ (2000) for an idea of what Frank Zappa’s son can do with a guitar in his hand) so that the next time these three decide to go out on the road together, they invite Dweezil along and give us G4.The mind positively boggles. If you like this CD, there is also a DVD of a different concert from this tour with different set lists, so you can fill your ears and your eyes if you so desire. Three brilliant young men caught at the top of their game. Enjoy.